Bermuda is one of the most romantic places on earth. After all, it’s where I fell in love—and then, on an anniversary trip, where I was proposed to. How could I say no to my now-fiancé when he got down on one knee on an isolated cliff surrounded by crystal clear water? As a journalist, I’ve traveled all over the world and must attest there’s no place as magical as this 21-square-mile archipelago that sits in the middle of the Atlantic, just a short 2-hour flight from most major East Coast airports. 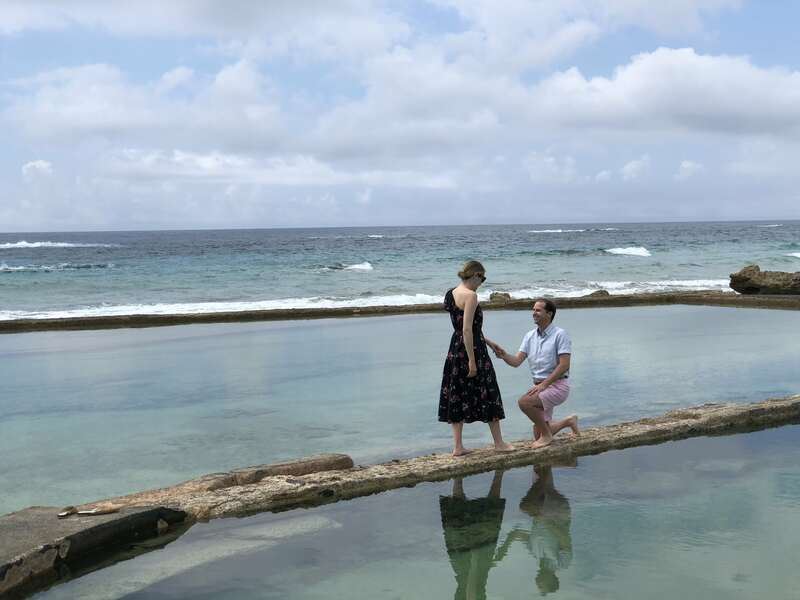 Whether newly dating, honeymooning, babymooning or celebrating a lifetime together, Bermuda has a way of casting love spells. From its candy-colored cottages to its cyan-speckled shores, the island’s colors are captivating to all lovers. A romantic getaway starts with an oceanside Swizzle-filled brunch at The Loren followed by a bike ride through the historical Town of St. George. From there, we’re off to share a fresh fish sandwich marinaside at The Hamilton Princess’ 1609 Bar & Restaurant. Once full, my fiancé and I would take a Twizy, an electric two-seat vehicle, for a spin to one of the beaches that’s awash with a kaleidoscope of colorful sea glass. For an afternoon-cooldown we grab a snow cone from one the many charming roadside stands. From there it’s time for an adventurous leap into Blue Hole—a gorgeous grotto tucked away within the dense foliage of a nature reserve. Our dream day would top off with chartering a boat (sailbermuda.com) and sailing off into one of the most neon sunsets you’ve ever seen. For more information and to plan your romantic getaway to Bermuda, visit gotobermuda.com.